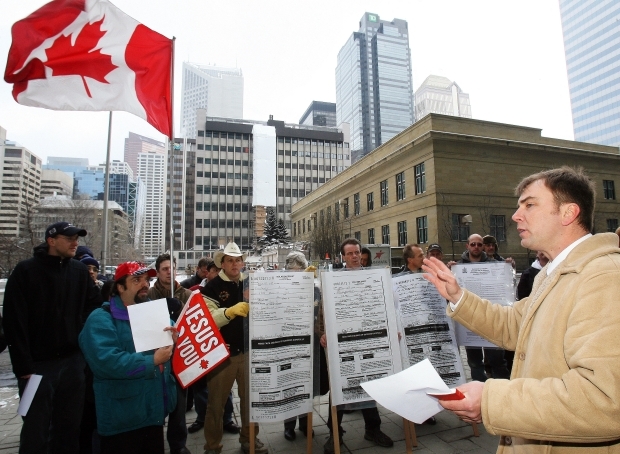 Artur Pawlowski and his supporters gather outside of the Calgary Courhouse Monday in March 2008. The province’s top court has upheld convictions against street preacher Artur Pawlowski for using loudspeakers to amplify his sermons in a downtown-city park in 2006. Pawlowski was initially found not guilty relating to five violations of the city’s noise bylaws and two violations of provincial traffic safety legislation that occurred between April 13, 2007, and June 18, 2007. He concluded that the ban on amplification systems in parks was a practical method of controlling noise in the use of public parks, and is probably the most practical and effective way of doing so. “With respect to proportionality, the appeal judge concluded that as Calgarians are entitled to a healthy environment which includes noise control in city parks, the beneficial effects of the bylaw outweigh its prejudicial effects,” said Court of Appeal justices Jean Cote, Peter Martin and Bruce McDonald. Between 2005 and 2006, Pawlowski was initially granted several permits by the City of Calgary without prohibitions on the use of amplified sound. said the appellate court’s ruling. However, in the fall of 2006, the city started to receive noise complaints from members of the public who lived blocks away from the amplified sermons as well as others from across the Bow River. That prompted the city to permit a conduct outreach at Triangle Park for all of 2007, but expressly prohibited the use of amplified sound. The city informed Pawlowski that he could not longer use amplified sound and was going to revoke the 2007 permit. It was revoked on April 24, 2007, after which Pawlowski made no further applications because he said he was told they would not be granted. Then came the series of violations. Defence lawyer Michael Bates argued that the summary conviction appeal judge erred in finding that the bylaw was a minimal impairment to his freedom of expression and that the beneficial effects of the bylaw outweighed its prejudicial effects. City lawyer Ola Malik responded that Pawlowski knew and understood the permitting process, and relied on the proposition that courts must defer to municipalities in the choice and management of their regulatory process. “We agree with the appeal judge that controlling noise and having peaceful use of the city’s parks is rationally connected to the objective of accessibility or enjoyment by the public,” said the appellate court.